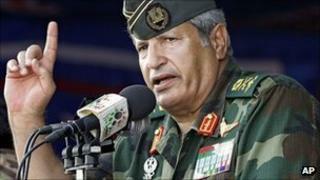 A Libyan court has ordered ex-interim leader Mustafa Abdul Jalil to be questioned over the 2011 killing of top rebel commander Abdel Fattah Younes. Mr Jalil, who chaired the now-dissolved National Transitional Council (NTC) when Gen Younes was shot, gave varying accounts of how the commander had died. Eleven people have so far been charged in connection with the murder case. Gen Younes was viewed with suspicion because of his formerly close position to deposed leader Muammar Gaddafi. The commander had been part of the group that helped bring Col Gaddafi to power in 1969. He served as interior minister before becoming the highest-ranking military leader to defect to the rebel side in February last year. A few months later, his body was found riddled with bullets on the outskirts of Benghazi. The fatal shooting occurred shortly after Gen Younes had been issued with a warrant for questioning and recalled from the front line in the city of Brega. Varying accounts of how he was killed were then given by officials at the time, including Mr Jalil. "The court demands the referral of Mustafa Abdel Jalil, former head of the NTC, to military prosecution for investigation in the case of Abdel Fattah Younes," judge Abdullah al-Saidi said in a statement on Wednesday. "We will then take a decision based on what the investigation reveals." Gen Younes's son, who had attended the hearing, said the ruling was a "a great step forward", Reuters news agency reported. A small crowd gathered outside the courtroom chanted: "Your blood will not go in vain, oh colonel", according to the agency. Of the 11 suspects involved in the case, only one man has so far been charged with the actual killing and remanded in custody. Earlier this year, a judge investigating Gen Younes's death was gunned down on his way to a mosque in Benghazi. In a separate development, Sarah Senussi, the daughter of jailed Libyan ex-spy chief Abdullah al-Senussi, said her father was being denied access to lawyers. Mr Senussi, who is currently being held in a prison in Tripoli, is suffering from kidney cancer, according to Ms Senussi. "I haven't spoken to him in over 60 days and his lawyer hasn't been allowed in to see him," she told Reuters in a telephone interview. "Human rights organisations have asked repeatedly to visit him and they have been refused also." Ms Senussi added that she did not know whether he was receiving medical treatment. In June 2011, the ICC issued a warrant for Mr Senussi for crimes against humanity alleged to have been carried out in Benghazi, the main base of the Libyan opposition during the revolt last year. He was arrested earlier this year at Nouakchott airport in Mauritania after flying in from Morocco, and subsequently extradited to Libya.